As western tourists have steadily flocked eastward to the former Warsaw Pact nations, the likes of Budapest and Prague — two capital cities — are the most common destinations. But sandwiched in between is another capital with an equally rich history and heritage, boasting architecture that rivals any in central Europe, and providing the gateway to the lovely Carpathian mountains of eastern Slovakia. This city is known by several names — Preßburg to older Germans, Pozoný to the Hungarians — but the world knows it now as Bratislava, capital of the Republika Slovenska, or Slovakia. This post was originally written in 2001 and I have not edited it much (changes will appear in italics). The new Slovakian flag can be seen flying everywhere in Bratislava, such as the Residence House above. 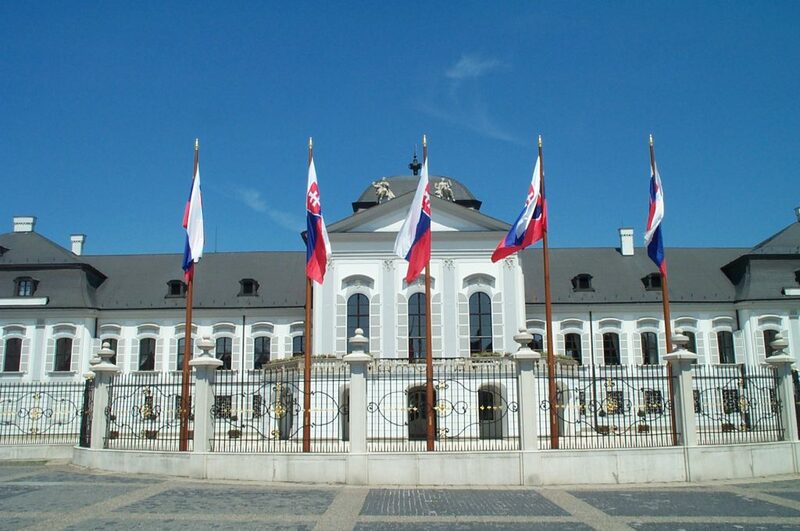 The full translated name of this building is the “Residence of the Government of the Slovak Republic” and is located at a major road junction in the middle of downtown. Behind where I stood to take this photo is a large fountain of water eminating from a metallic globe — perhaps symbolizing this formative nation’s vision of its place in the world in the future. Such a vision would surely be rooted in the city’s past. 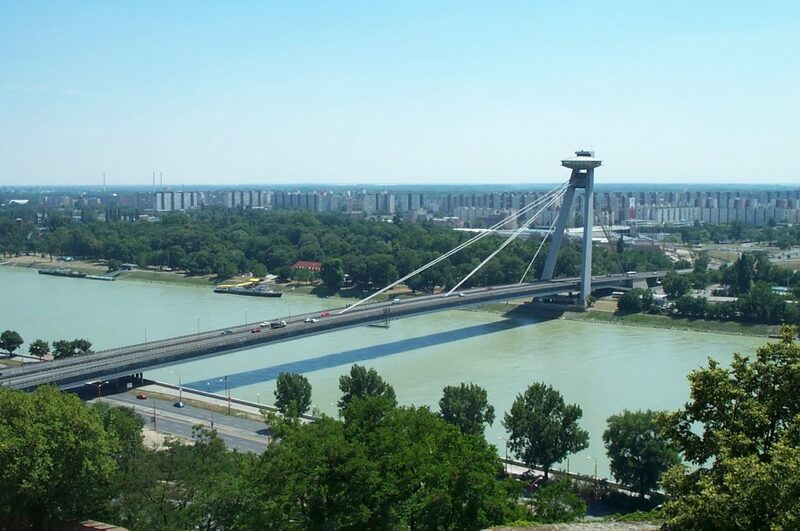 Bratislava was once where the monarchs of the Austro-Hungarian empire were crowned. These coronations took place at what is now the city’s premier attraction: Bratislava Castle. 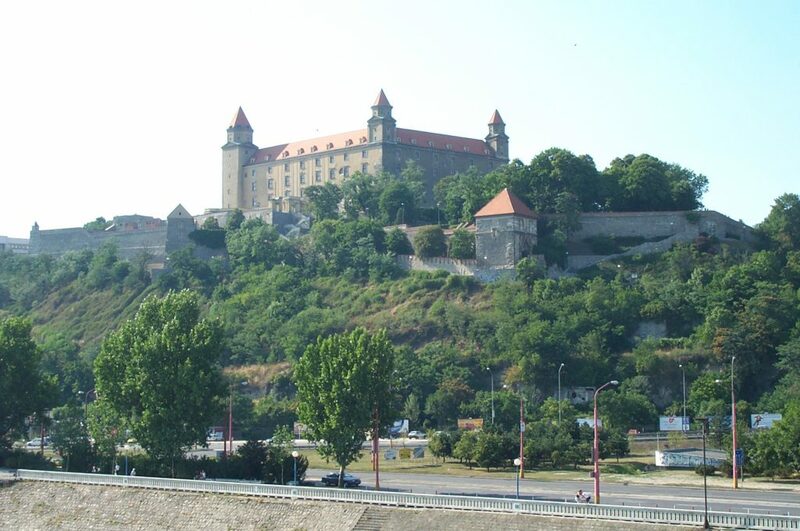 Bratislava Castle sits high above the Danube River, with its guard towers spread out over a wide area. The outer walls bound a large park, while the castle interior has been converted into several museums — one being a display of royal coins and jewels, another a complete history of the Slovak people, a third is used periodically as an art gallery. A charming coffee shop sits at the top floor. (Note that the Bratislava Castle has been re-painted white and trimmed more in the red and blue colors of the Slovak flag — this can be seen in the sidewalk view from Google Maps). Also visible from the castle are the remnants of the old city walls, seen above. 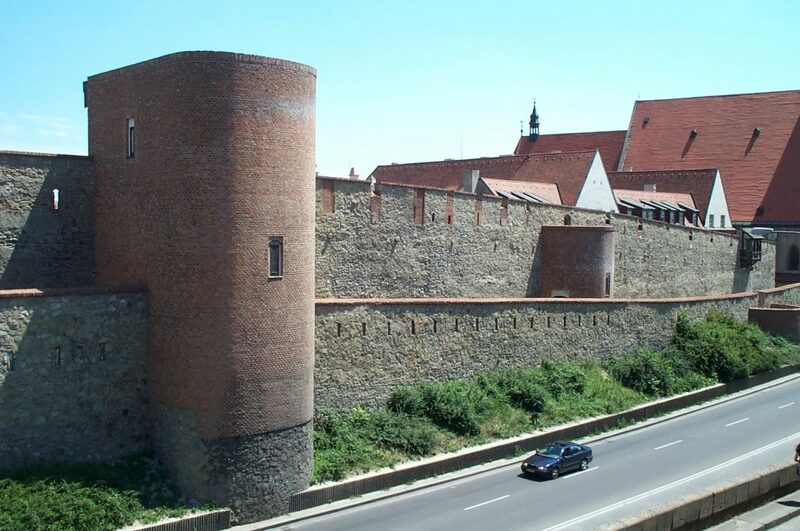 Roughly one-fourth remains of the walls that once surrounded the city below the Bratislava Castle. While the walls themselves are not accessible to the public, the interior is, and it ranks among the largest of pedestrian zones I’ve encountered. It covers almost a square mile, and is loaded with pubs, restaurants, shops, … and embassies (this is, after all, a capital city). 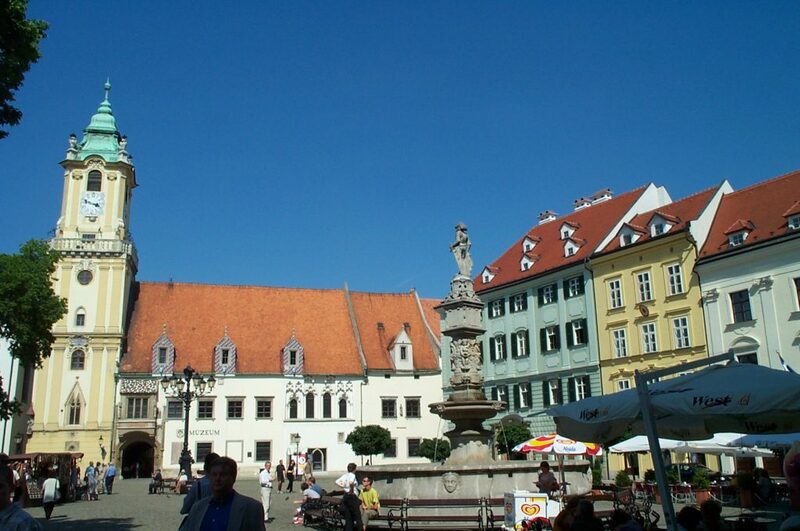 The main marketplace is shown above, with the old Town Hall (the yellow tower) shown on the left. On this day, the sun was burning hot, and by late afternoon there were thousands of people filling the bars and cafés. And at six koruna a scoop (12 cents US), the ice cream was both inexpensive and enjoyable! I spent hours walking around the city looking at the architecture — very classic, and for the most part well maintained. The National Theater and National Museum near the Danube are absolutely gorgeous buildings, as is the Primiatalpalais. Also, when you see the Residence building, go around to the back — often open to the public, there is a large enclosed park that contains numerous interesting sculptures from Slovakian artists. 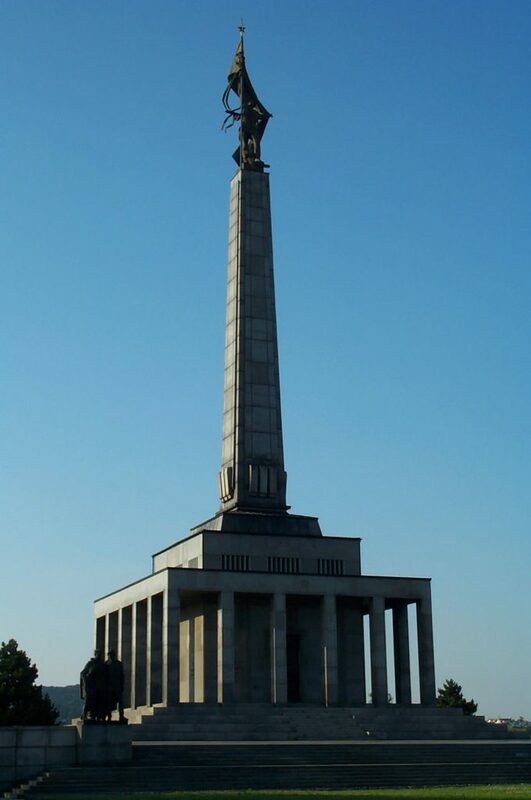 This is the forty-meter-tall Slavín World War II Monument, and it honors the Slovaks and Russians who gave their lives on the eastern front. Over 3,000 soldiers are buried here, their headstones written in the Cyrillic alphabet. There are several other monuments and statues on the site as well — it is worth the climb (although it’s a tough one, parts of it are 21-degree grade, and it’s not well marked). Words and pictures do not tell the whole story of this city — seeing is believing. There is so much to see in Bratislava, and so much to enjoy, you will leave wondering why the rest of the touring world hasn’t taken notice. Well, perhaps it will… word among tourists and travel buddies tend to spread pretty fast!